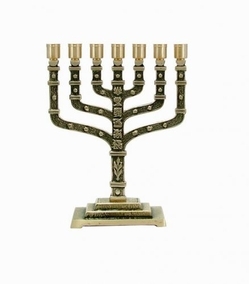 7 Branched Menorah #516a is hand-made in Israel and approved Kosher by the relevant Jewish Authorities. 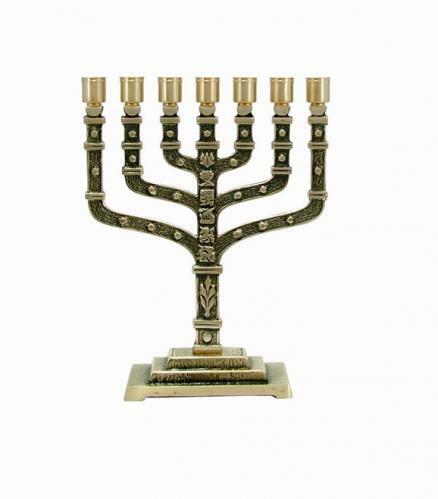 The Seven branched Menorah is a great piece of Judaica and found in many Jewish houses, Synagogues and schools. This one is made of high quality brass and designed by Jewish artists. The Jewish Menorah is a seven-branched candelabrum, and a symbol of Judaism for almost three thousands years. The Menorah is the emblem of Israel,and used in the Holy Temple in Jerusalem. The Menorah symbolizes the burning bush seen by Moses (Moshe Rabenu) on Mount Horeb (Exodus 3). The construction of the temple menorah was considered a religious order in Judaism. Terumah portion (Parshat Terumah, Exodus 25:31-40) teaches us about this great Jewish Holy Vessel; 31 And thou shalt make a candlestick of pure gold: of beaten work shall the candlestick be made, even its base, and its shaft; its cups, its knops, and its flowers, shall be of one piece with it. 32 And there shall be six branches going out of the sides thereof: three branches of the candlestick out of the one side thereof, and three branches of the candle-stick out of the other side thereof; 33 three cups made like almond-blossoms in one branch, a knop and a flower; and three cups made like almond-blossoms in the other branch, a knop and a flower; so for the six branches going out of the candlestick. Packaged carefully with love. Try our great gift wrap and gift message services.